Keep Watch for Bite Problems with your Child's Teeth - Dr. Edwin J. Szczepanik, D.M.D. By Dr. Edwin J. Szczepanik, D.M.D. 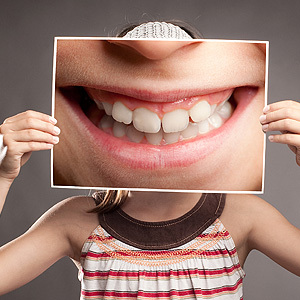 Around ages 6 to 8, a child's primary teeth will begin to loosen to make way for their permanent teeth. If all goes well, the new set will come in straight with the upper teeth slightly overlapping the bottom. But sometimes it doesn't go that well: a child may instead develop a poor bite (malocclusion) that interferes with normal function. If we can detect the early signs of a developing malocclusion, however, we may be able to intervene and lessen its impact. You as a parent can play a vital role in this early detection. The first thing you should be watching for is teeth spacing.Â Normal teeth come in straight with a slight gap between them. But there are two abnormal extremes to look for: teeth having no space between them or crowded together in a crooked, haphazard manner; or they seem to have too much space between them, which indicates a possible discrepancy between the teeth and jaw sizes. You should also notice how the teeth come together or “bite.” If you notice the lower front teeth biting in front of the upper (the opposite of normal) it may be a developing underbite. If you see a space between the upper and lower teeth when they bite down, this is a sign of an open bite. Or, if the upper front teeth seem to come down too far over the lower, this could mean a deep bite: in extreme cases the lower teeth actually bite into the roof of the mouth behind the upper teeth. You should also look for crossbites, in which the teeth in one part of the mouth bite abnormally in front or behind their counterparts, while teeth in other parts bite normally. For example, you might notice if the back upper teeth bite inside the lower teeth (abnormal), while the front upper teeth bite outside the lower front teeth (normal). The important thing is to note anything that doesn't look right or seems inconsistent with how your child's teeth look or how they function. Even if you aren't sure it's an issue, contact us anyway for an examination. If it really is a developing bite problem, starting treatment now may lessen the extent and cost of treatment later. If you would like more information on bite development in children, please contact us or schedule an appointment for a consultation.